November is Adoption Awareness Month – a time to raise awareness about the urgent need to find adoptive families for the 7,000 vulnerable children in our government care system and children in orphanages throughout the world who are at risk of growing up without a secure family connection. This year the ACO is working in partnership with Ontario Association of Children's Aid Societies (OACAS), Adopt4Life (A4L) and the Children's Aid Foundation (CAF) to use November to start a year long campaign - Kids Deserve a Family - every day and all year long. We know that Adoption gives children and youth a ‘forever family’ when they cannot live with the family they were born into. We also know that the journey can be fraught with hurdles, barriers and curves in the road. As a province we must all commit to working together to reduce the barriers, support families with the challenges and build partnerships for permanency that will ensure that every child has a FAMILY – to grow up and grow old in. 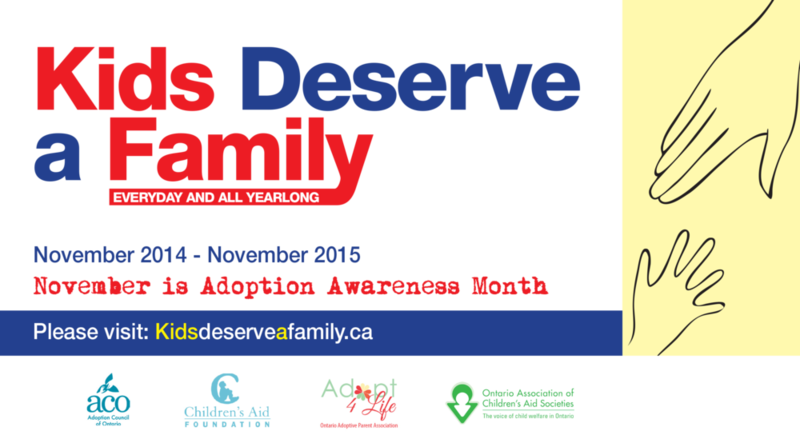 There are also lots of great ways you can celebrate adoption in your home and your community. Keep in touch this month - share your thoughts, ideas, stories. Let's make some noise this November to start the conversation. Let's keep the conversation going ALL YEAR and see what we can accomplish by November 2015.